The Dutch National Railway Company recently unveiled a series of flexible and modular train configurations that could to adapt to the countless ways commuters like to sit on trains. The company chose Dutch architecture firm Mecanoo and furniture company Gispen to collaboratively develop an idea of what its trains could look like by 2025, and the result may impact the future of transportation. Their goal was to design a train that not only serves a method of transportation, but one that could also be a lounge, office, and space where travelers can enjoy their “own time,” rather than solely wait until they arrive at their next destination. 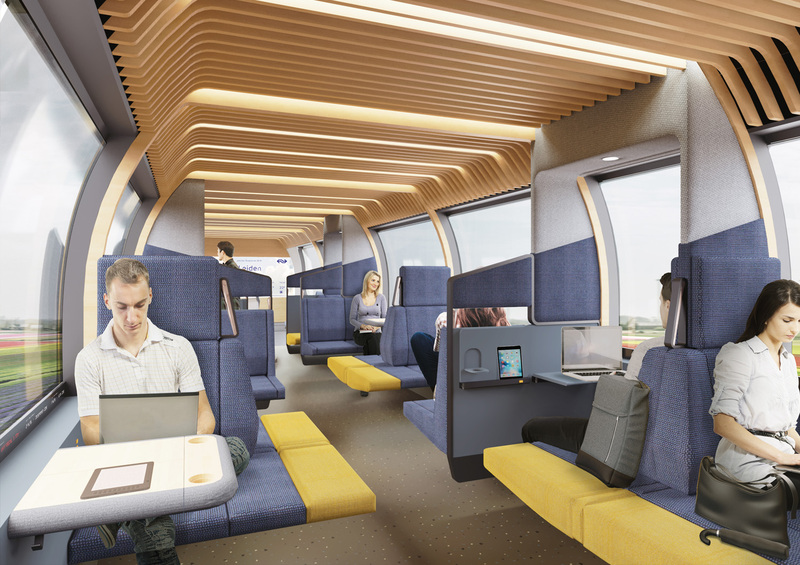 As a result, the train interior design concepts are meant to be flexible to accommodate train passengers’ preferred environments and activities. Mecanoo and Gispen conducted research regarding train passengers’ activities, and they determined that there are six different types of activity zones that passengers prefer, varying from “open and social” to “private and concentrated.” By designing 12 different furniture modules, Mecanoo and Gispen were able to propose a train configuration that facilitates each of these zones. Most importantly, the firms have created a space where every traveler can find a comfortable place to sit, custom tailored to their activity, group size, needs, and travel time. For example, along with the classic two-seat configuration are a U-shaped group of seats that surround a foldable table, single seats that come with a desk, and even a multi-tiered bleacher seating design. The different layouts of the train’s interior make it appear open, comfortable, and hospitable to people from all walks of life. The fabrics are reusable and the module compartments can be disassembled and reconfigured with ease. While the designs are still in their conceptual phase, the project seeks to eventually become real and reinvent become into a comfortable, pleasant, and efficient experience. Shopping these days is often done online, making street-level urban and suburban commercial retail spaces eerily vacant, but this was not always the case. Consider Rotterdam's Lijnbaan. The Lijnbaan, a large-scale development for Rotterdam proposed by Dutch architect Jo van den Broek, was made of housing and commercial buildings. Around 100 shops were built in two phases: the north part was completed in the 1950s, which is now preserved as a rijksmonument (a national heritage site), and the southern arm was done the 1960s and was open to change. Both arms received much publicity for their pedestrian orientation. This urban complex arose on the ruins of a Rotterdam that was bombed on May 14, 1940, by Hitler’s Luftwaffe. Cornelis Van Traa designed the urban plan for the center of the city and instead of following the historic forerunners of the street system, created a new system, precisely for a changed society. The freshly conceived apartment buildings’ designs were headed by Hugh Maaskant and his associates and, germane for our subject, the handsome "new objectivity" Lijnbaan shops along a mostly “L-Shaped” street system were credited to the architectural firm Van den Broek and Bakema. The main architects were Jaap Bakema and Frans van Gool. The former is the subject of a new book, Dirk Van Den Heuvel’s Jaap Bakema and the Open Society. Bakema gained his reputation for his participation in Team 10 and his large-scale building production. Van Gool designed but also oversaw construction and made stunning perspectives of the shops. However, the authorship of the Lijnbaan quarters is somewhat blurred, since responsibilities were shared by the architects’ offices and city officials, as occurs frequently in many urban projects. Mostly all the shops, placed in double rows in the 18-meter-wide plan, were built of reinforced concrete frameworks with prefab elements and brick walls filled in. Iconic canopies were made of steel and wood; they protected and ran along most of the shop rows. Also, there were seven lines of canopies that stretched across the landscaped areas that separated the shop rows. These in-between areas were furnished with many attractions; landscaped zones with flowers and trees were accompanied by kiosks and benches. Delightful for strollers, they now suffer from wear. While the southern arm of the complex is in turmoil, the northern part is being restored by Robert Wankel of Mei Architects. Most notable is their restoration of the Lijnbaan 77 on the corner of the Aert van Nesstraat. Working under the auspices of an area regulation pact, “Lijnbaanregeerakkoord,” Mei Architects have given the frayed parts of the canopies sensitively treated materials in accord with the preexisting concrete and wood. Even more recent is the work of Kees Kaan who has designed the Schaap en Citroen jewelers and fashion retailer COS shop on the corner of Karel Doormanstraat 278. Formerly Martin’s Tearoom, its 3-story corner block is incompatible with other 2-story Lijnbaan shops. Yet, it is tame in comparison with the towering blocks proposed nearby. 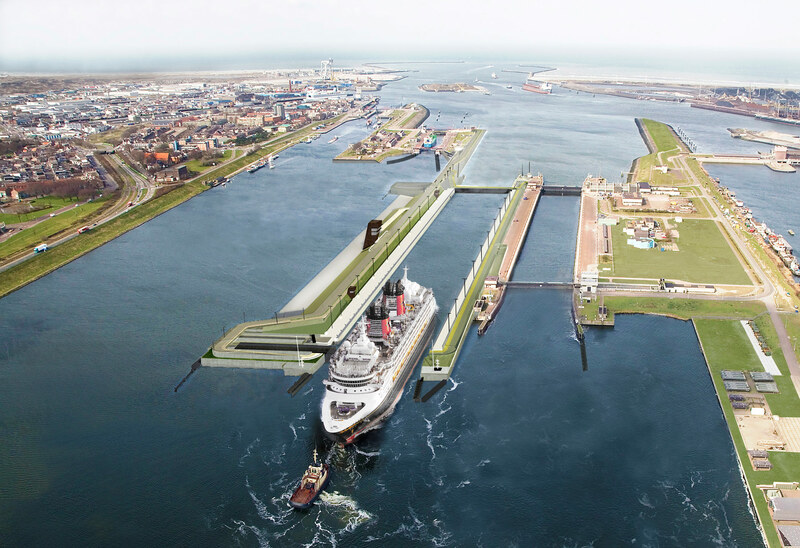 The southern arm of the Lijnbaan, which is not eligible for 50-year preservation status, is being threatened by moneyed interests and a high powered designer, Rem Koolhaas, and his firm, OMA. Commerce is vital, but when it drowns out human values it needs to be upended. Multi Nederland is the developer and the "star" architect is Rem Koolhaas—former supporter of the social values of shopping and the preservation of historical modern buildings. Developer and architect have bowed to the expedient forces and designed an ugly tower complex (maybe they think it's delirious). Koolhaas and Reinier de Graaf, OMA's partner in charge, ignore the unified low-rise nature of the Lijnbaan shops. It is all very cynical as Dirk van den Heuvel, says—the city needs the money and automatically forgets the prize-making history of the Lijnbaan, the jewel of postwar Rotterdam’s modernist ideals. As the great urban historian, Lewis Mumford, pointed out, the shopping experience for pedestrians is of great importance. The anti-preservation forces even include Wessel de Jonge, co-founder of the Docomomo organization which purports to preserve endangered modern architecture. Demolition work has already begun on badly maintained shops, so the tragic end may be near. 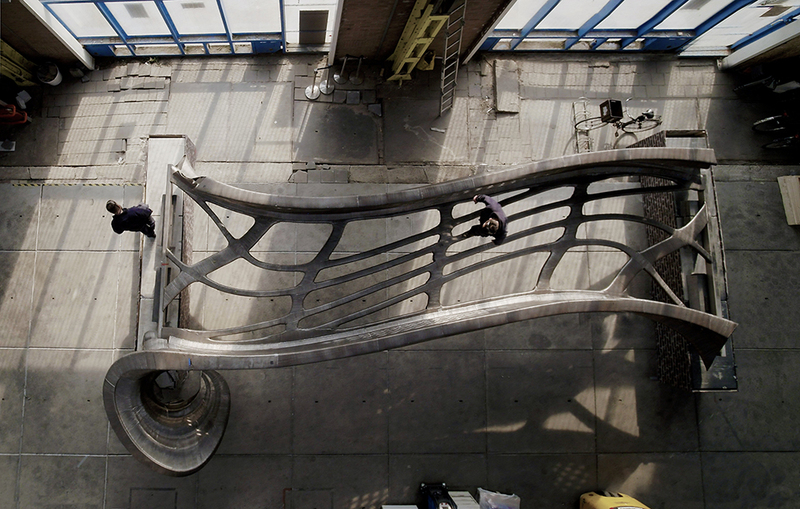 Amsterdam-based firm MX3D has completed the full span of its 3-D-printed stainless steel bridge, designed by Joris Laarman Lab, a multidisciplinary team located in the Netherlands. The bridge will cross one of the city’s oldest canals, the Oudezijds Achterburgwal, and is approximately forty feet in length and over twenty feet wide. Often using digital fabrication and 3D printing, the Joris Laarman Lab has over seventy projects featured in thirty-seven museums across ten countries including MoMa and the Centre Pompidou. Utilizing software specifically designed by MX3D, the bridge was constructed by four multi-axis industrial robots. In total, it took six months for the robots to print the nearly five-ton 3-D printed bridge. While the construction process did require human input, the overall project tested the feasibility of robots printing bridges without human intervention and ultimately validated such an approach for future projects. In a collaboration with The Alan Turing Institute, the long-term management of the bridge will rely on the use of a smart sensor network that is capable of testing structural measurements, such as vibration, strain and displacement, along with air quality and temperature. Through data collection, engineers will create a ‘digital twin’ of the new bridge, a constantly adapting computer model that reflects the structures altering state. This model allows for the effective repair of the bridge and provides insights and guidance for future construction. The bridge will be subject to further structural testing as well as decking and coating. The expected installation date is October 2019. 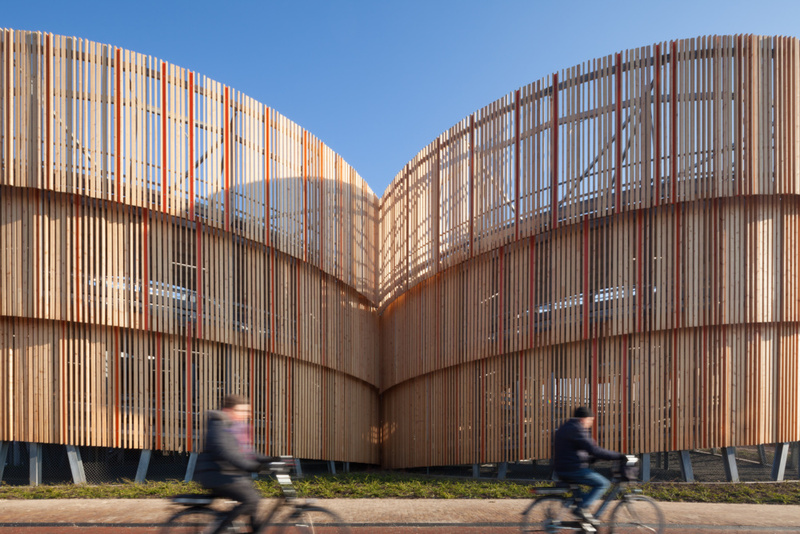 Netherlands-based MoederscheimMoonen Architects has enlivened a utilitarian parking garage with a unique wood and steel screen assembly backed by an expressive steel structure. The project was commissioned by NS Stations, a Dutch company that manages over 400 railway stations in the Netherlands. The design of the car park references the industrial character of its town, Zutphen, which is situated in the eastern part of the Netherlands. The architects achieved this through materiality and form. The car park—located adjacent to the town’s train station—houses 375 cars and over 600 bikes, and is structured to accommodate an extra story for future growth. Siting of the elongated building was specifically configured to facilitate pedestrian and vehicular traffic under two railway crossing points. Bookending the elongated building are two distinct formal moves. One side contains a silhouette of a gable-shaped wall that flies off the structure of the main building, referencing a traditional warehouse typology common to the area. On the opposing end, two helix-shaped ramps generate distinctive views of the building with a tiered screen wall cladding that gradually steps away from the building as cars travel up the ramp. The architects say this configuration lends the building a “markedly sculptural and dynamic appearance.” The screen wall is composed of prefabricated unitized panels composed of wooden slats arranged in two rotations and red steel bars as spaced accent pieces. In the evening, the slats reveal vertical LED lighting strips, which are used to light up the entire building. The slats were mounted onto a steel frame in the shop, then transported to the site in batches where they were installed onto a primary steel frame which is held off the concrete floor slab structure of the parking garage. “By turning the slats in some places 90 degrees and enriching the facade with red metal strips and led lighting, a lively and playful facade with a human scale is created,” said the architects. This subtle detailing produces variations in the facade to achieve a dynamic, open surface. As a cladding system, the slat assembly promotes passive lighting and ventilation. The screen panels are lifted above the first floor, creating a raised facade effect, and expose the canted galvanized steel structure. This also helps daylight to penetrate the ground level of the car park. The interior of the car park satisfies the most stringent requirements set by the European Standard Parking Award (ESPA), a points-based system similar to the American-based LEED system, but specific to the car park typology. 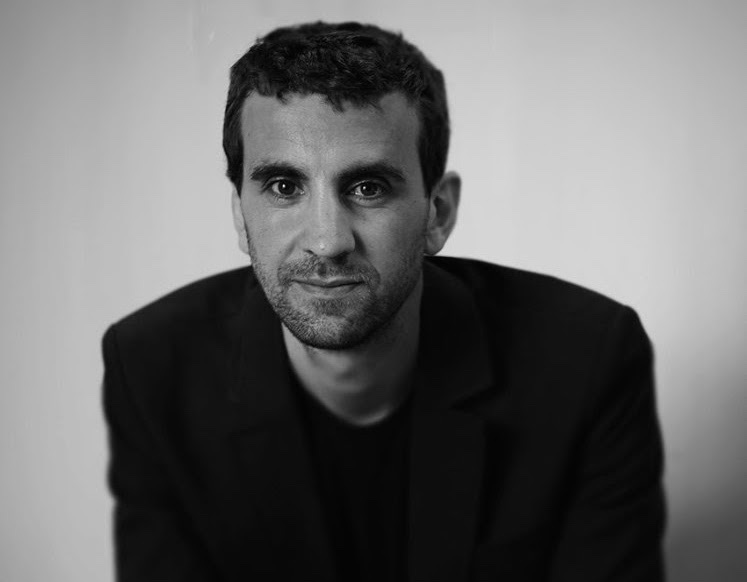 The founder of Italian studio Space Caviar, Joseph Grima, has been appointed as the creative director of Design Academy Eindhoven (DAE) as well as chair of the academy's executive board. Grima will begin his tenure starting from September 1 of this year. He will be in charge of the academy's curriculum and will work alongside Jurriënne Ossewold, a current board member who is director of education, research, and organization. DAE is funded by the Dutch government and is provided a yearly budget of $11.4 million. The job requirements listed by DAE noted that "a sense of humor [...] comes in handy," going on to add that "ultimately, all this is about the future of our students. No less." Grima, who is 40, will take the place of Thomas Widdershoven, who stepped down from the post in 2016. In addition to founding and running Space Caviar, Grima is also director of the New Museum Ideas City festival in New York. In 2015 he co-curated the inaugural Chicago Architecture Biennial with Sarah Herda. “Despite the extraordinary proliferation of design schools in recent years, there is still an acute shortage of places that actually question what design is," said Grima in a press release. "Design Academy Eindhoven isn’t a school where students simply learn design—they design design, and each day rethink the parameters through which it shapes society. I look forward to working with the Academy’s exceptional staff to help them build a place in which the future is born.” Gitta Luiten, chair of the Supervisory Board, commented on Grima's appointment: “We looked for someone with an international perspective on design and a heartfelt interest in education. Joseph Grima fits those criteria: his views on design and society and his international experience will benefit the students and the Academy,” she said. OMA's Timmerhuis project for Rotterdam, a gleaming stack of municipal offices, will open to the public on December 11, 2015. 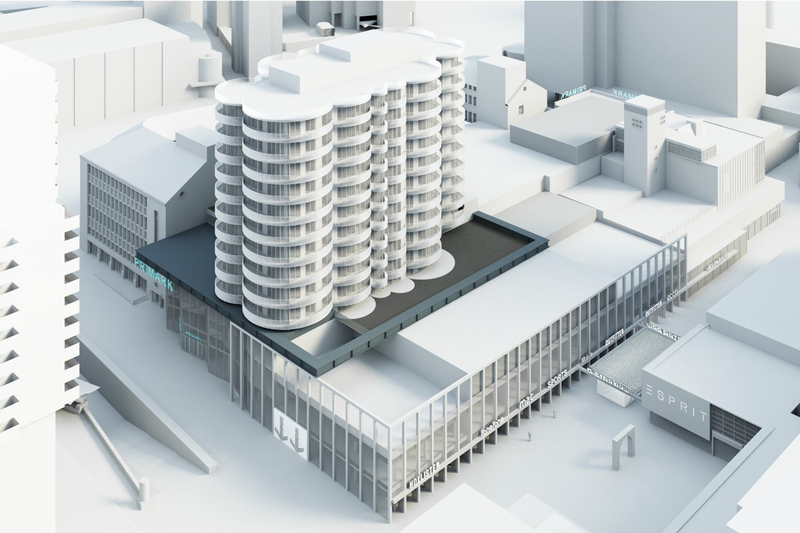 The mixed-use building will primarily house office space taking up 262,000 square feet with residential, parking, gallery, and retail spaces occupying the rest of the building. The design for Dutch developers Ontwikkelingsbedrijf was lead by OMA partner Reinier de Graaf and associates Alex de Jong and Katrien van Dijk and will be only a stone's throw away from the firm's other, already built project in the city—the towering De Rotterdam. A modular aesthetic is created via the stratified composition of repeated units stepped back from the street and would be reminiscent to a game of architectural Tetris if it weren't for the building's glass facade that makes use of high-tech,translucent energy-efficient insulation. Adaptability was a key component to the project's program, Rem Koolhaas said in a statement. "Units can be added or even dismounted from the structure as demands on the building change over time, and can adapt to either office space or residential parameters as desired." OMA also wanted to create the possibility of having an apartment with a garden in the city center, so green terraces are featured on higher levels while overhanging modules create open spaces at street level, adding a private/public threshold between the dwellings at the city. According to Koolhaas, the design brief required Timmerhuis to be "the most sustainable building in the Netherlands." 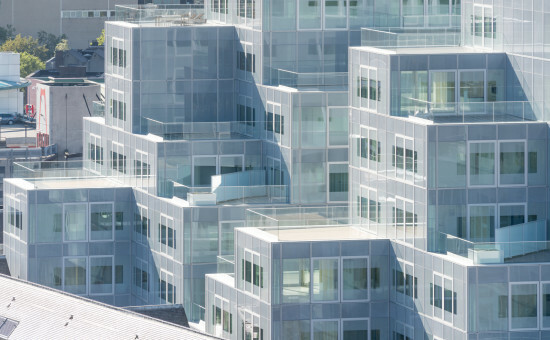 OMA achieved this via the buildings flexible program and thanks to two large atriums which essentially act as the "building's lungs." These lungs are integrated into a climate control system that retains the summer heat, releasing it in the winter. Likewise, cold air from the winter is stored to be released in the summer. "Rather than being yet another statement in Rotterdam's crowded history of revisionist planning and cacophony of architectural styles, the ambiguous mass of the Timmerhuis tries to mediate between the existing buildings surrounding it," Koolhaas said. "The axis between the existing town hall and the post office coincides with the axis of symmetry of the Timmerhuis , and the street between these two buildings continues into a passageway to the Haagseveer," he continued. "The Timmerhuis integrates with the neighbouring Stadtimmerhuis by maintaining the same floor heights, while the plinth height of 20m conforms to the character of the surrounding Laurenskwartier." Het Nieuwe Instituut (HNI) is an arts institute for exhibitions, lectures, and research on architecture-and-design-based disciplines in Rotterdam. The institute's Dutch compatriots MVRDV have just signed a contract which will see the practices early work be uploaded to a new digital archive. The collection will feature MVRDV's work from 1993–2008 and both parties have agreed for the online database to be updated in the future. HNI also aims to make the collection open to the public at a later, yet-to-be-decided date. 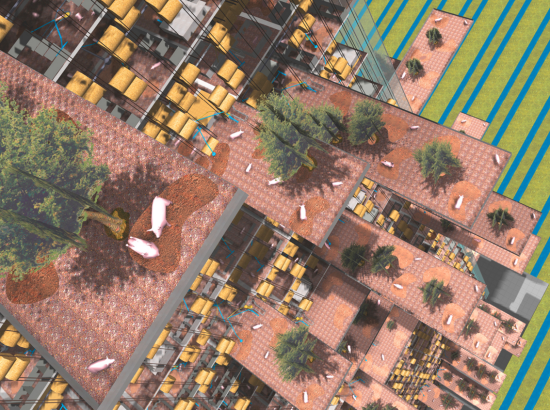 To quantify the scale of the database, it will boast 400 MVRDV projects, stored in eight terabytes. The archive hopes to illustrate the firm's architectural development over time. 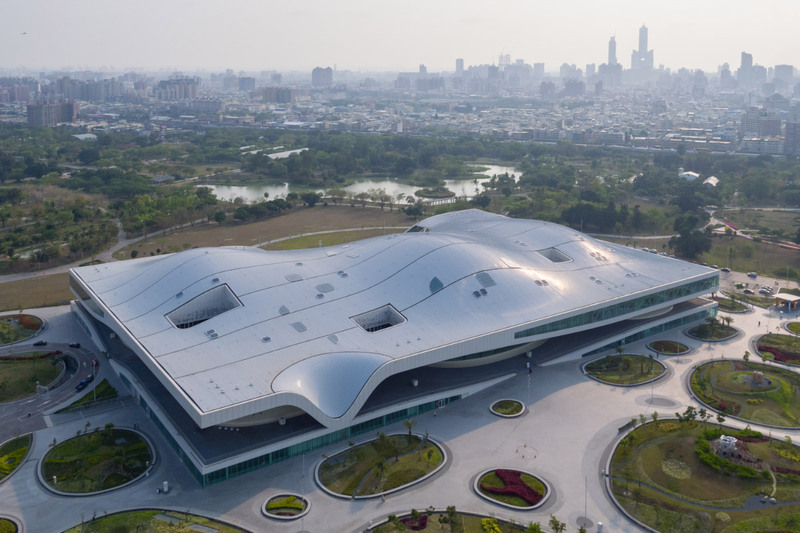 "We have discussed various possibilities with museums around the world, and we will also give parts of the archive to other collections," Jacob van Rijs, architect and co-founder of MVRDV, said in a statement. "But because our archive is digital, there is an opportunity to show every project book we’ve ever created at HNI. That will be a treasure trove for researchers." 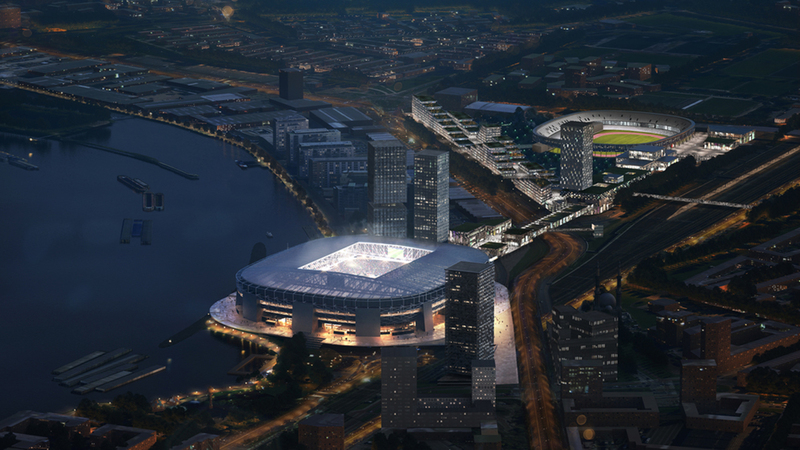 Some of the projects featured will include: Villa VPRO, the Silodam and the Markthal Rotterdam, as well as more theoretical projects based on data analysis, an early fascination of MVRDV: Meta City Datatown, Pig City, and 3D City Cube. 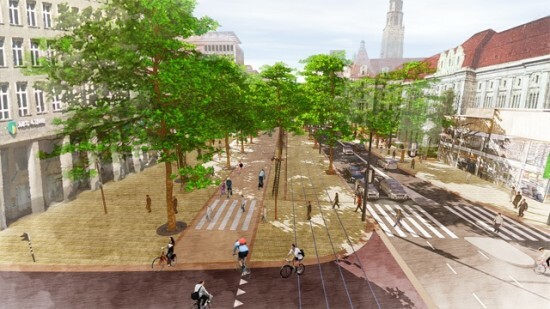 This month, Adriaan Visser of Rotterdam's city council and Adriaan Geuze, principal of landscape architecture firm West 8, unveiled a new plan for the municipality's 0.6 mile long Coolsingel. The streetscape aims to restore the allure of the 19th century boulevard which once defined the area. Boasting a new green esplanade with natural stone paving, the street will have a two-way bike path that is expected to liven up the space which is currently dominated by cars. Officials reiterated that West 8 in tandem with local authorities hope to make the boulevard into a place that is comfortable for both pedestrians and cyclists. They added at one day Coolsingel could become the new heart of downtown Rotterdam. West 8 described its proposal as a place for "all seasons." Utilizing a pre-existing green space, the Rotterdam- and New York–based firm calls for an environment that will be "framed by trees, terraces and pleasant seating areas." Changes to the Coolsingel are part of a wider scheme called the Binnenstad als City Lounge program (literally, the City Center as a City Lounge) that intends to kick-start developments in the city to make it "more lively and attractive." In what is becoming quite a trend, streetscape projects that aim to prioritize pedestrians and cyclists are cropping up more and more as architects and cities notice the importance of place making. Recently, six United States–based placemaking organizations were awarded $3 million each to develop their respective cities. Other pedestrian-first projects of note include Danish firm Bjarke Ingels Group (BIG)'s Superkilen, which added a splash of color to Copenhagen's streets with its street-turned-park-turned-museum. Like Rotterdam, Mexico City is also set for a environmental injection as Fernando Romero, principal at FR-EE, just revealed plans earlier this summer for a green street in the capital city's Avenida Chapultepec.